This is the time of the year where New York becomes the Arts and Culture capital that is has always touted to be. The ARMORY SHOW, the pinnacle of gallery week in New York has really lifted the bar even higher this year. The lounge areas are like being in a Museum. They are wonderful. The global art world is represented here in all of it glory, wonder and awe. 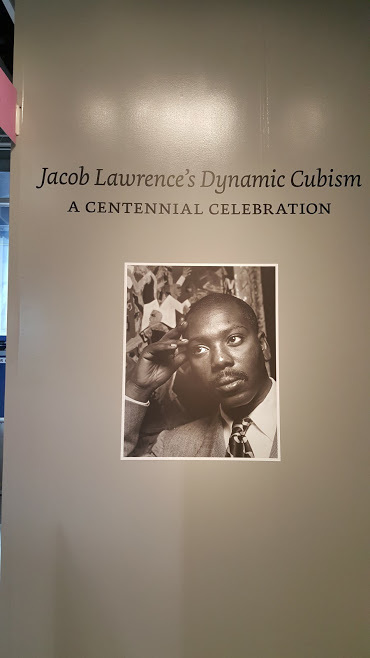 I was very happy to see Jonathan Boos Gallery dedicate its whole exhibit on Jacob Lawrence! Jacob Lawrence was one of artistic visionaries of our time. His art is based in Cubism and is influenced also by his living in Harlem, New York. His work jumps off the canvas! Such great colors and feeling. There are many artist of color that are being featured in the show and I am very happy about it. Its all about culture and art is a part of our culture the same as music, theater, dance and I can add food. They flow into one another. That is why the Harlem Renaissance was so powerful. It included all and more of these art forms and from there some of greatest art and artist, writers, speakers of our time were created. There are several more art things going on in the city this week including the Park Avenue Arts show, MODA has special events going and and all of the galleries in the city are having special open houses and events. This leads me into saying, we really need to support our artists everyone. As in Egypt, Greece, Rome, China; every culture lead with its artists. Artist told the story of the time; we must not forget that. I am a collector of art myself. There are many ways you can become an art collector. You dont have to spend hundreds of thousands of dollars; you can purchase prints and many other things artist create to stay afloat. They can be affordable. Art is something that increases in value with time so it is an investment; so get going! Go to art fairs; I am not talking about flea markets!! You can find some good things there but I am talking about art fairs where artist are showing their work. This work is from their souls and it tells a story and documents a time that will be placed in the archives of time. So please go out to the Armory show, it is going on until this Sunday. Its being held at Piers 92 and 94, that’s at 55th street in Manhattan. It includes Contemporary and Modern Art. For more info and tickets go to http://www.thearmoryshow.com This show is not to be missed. There are so many things to enjoy not only this week but throughout the year. If not in New York City, go to your places of art in your city, they are there waiting for you. This entry was posted in The armory show and tagged Art galleries, artists, arts, international art, international art world, New York City Happenings, The armory show. Bookmark the permalink.